The Oklahoma Wildlife Conservation Commission accepted generous donations from the National Wild Turkey Federation and the North Fork Chapter of Quail Forever during its regular November meeting Nov. 5 in Oklahoma City. O.D. 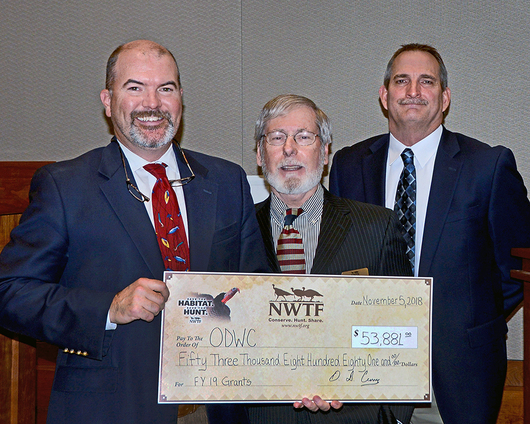 Curry, state president of NWTF, announced a total of $53,881 in donations and grants to fund requests from the Oklahoma Department of Wildlife Conservation for the coming year. Funded projects include $29,381 for habitat management at various wildlife management areas, $10,000 for the Oklahoma Archery in Schools Program, $10,000 for the Oklahoma Scholastic Shooting Sports Program, and $4,500 covering Wildlife Department employee travel expenses to NWTF national meetings. In most cases, the NWTF donations will be matched with federal grant money, effectively creating more than $175,000 in funding for Department projects. Jimmy Clark, North Fork Quail Forever Chapter president, donated $5,842 on behalf of his members in support of upland game conservation efforts at Black Kettle, Packsaddle and Ellis County WMAs. Clark’s group separately donated $2,400 to the Department’s Stars & Stripes Project, a donor-funded program that gives hunting and fishing licenses to military veterans and select survivors of veterans who gave their lives in service to the country. The Wildlife Department receives no state-appropriated funding, so this project allows the Department to show appreciation to veterans while maintaining revenue that supports important wildlife conservation in the state. Also, Commissioners were updated on a new electronic licensing system that is expected to begin operating Jan. 7, 2019. Assistant Director of Administration and Finance Melinda Streich said about 300 license vendors across the state have been notified of the coming changes and have been sent the necessary paperwork to convert to the new system. Sportsmen and sportswomen will experience greater convenience with the option to use a mobile device to buy and carry all of the licenses they require in the field in one app. The system will also feature an optional hard card that will contain all license information for a single person. Finally, Streich said anyone wishing to continue using paper licenses will have that option as well. Commissioners heard a presentation on a preliminary response strategy for dealing with chronic wasting disease (CWD) white-tailed deer, mule deer and elk, which has yet to be detected in free-ranging animals in Oklahoma. Jerry Shaw, Regional Supervisor in the Wildlife Division, said the Wildlife Department and the Oklahoma Department of Agriculture, Food and Forestry have been collaborating on a strategy that takes into account the best-practice recommendations of more than a dozen state, federal and conservation organizations. Wildlife and Agriculture officials say it is likely just a matter of time before a CWD-positive animal is again found in Oklahoma. In 1998, CWD was confirmed in a captive elk herd in Oklahoma County that had originally been imported from Montana. The preliminary response strategy remains under development as the Wildlife Department continues to evaluate input from many sources. The Commission was not asked to approve a CWD response plan at Monday’s meeting, but will be asked to approve a plan when one is finalized. Once a CWD-positive animal is found again in Oklahoma, the preliminary plan’s overarching goals are to actively identify CWD-positive areas, contain the disease, and mitigate any further spread of the disease. Authorized Director J.D. Strong to work with Gov. Mary Fallin’s office to negotiate a one-year extension of the Cherokee Nation licensing compact. Approved changes in the Department’s purchasing policies to reflect changes made statewide by Oklahoma’s Office of Management and Enterprise Services. Heard a report from Finley and Cook PLLC on the 2018 annual financial audit, which found no exceptions or issues with the Department’s financial operations, record-keeping and procedures. Approved emergency rules that will remove the requirement to immediately complete the Record of Game found on paper hunting and fishing licenses, in preparation for conversion to a new electronic licensing system scheduled for Jan. 7, 2019. Recognized Assistant Director Wade Free for 35 years of service, and Wildlife Division Research Supervisor Russ Horton for 30 years of service. Approved the addition of Tess Maune to the board of directors of the Oklahoma Wildlife Conservation Foundation. Approved the schedule of regular Commission meetings for 2019; each monthly meeting is set for the first Monday except for a meeting set for Tuesday, Sept. 3. The next scheduled Commission meeting will be 9 a.m. Monday, Dec. 3, 2018, at the Department headquarters, 1801 N. Lincoln, Oklahoma City.